Distinguished Senators,We are a coalition of Nigerian, African, and international organisations writing to you about the proposed Frivolous Petitions (Prohibitions, etc) Bill that has provisions for social media regulation. We believe that the bill is a dangerous encroachment upon free expression and we urge you to reject it from further consideration. The use of social media is a mainstay of free expression in the digital age, and criminalising its use under the guise of “frivolous petitions” will adversely impact human rights while violating the principles underpinning Nigeria’s own constitution. We are a coalition of Nigerian, African, and international organisations writing to you about the proposed Frivolous Petitions (Prohibitions, etc) Bill that has provisions for social media regulation. We believe that the bill is a dangerous encroachment upon free expression and we urge you to reject it from further consideration. The use of social media is a mainstay of free expression in the digital age, and criminalising its use under the guise of “frivolous petitions” will adversely impact human rights while violating the principles underpinning Nigeria’s own constitution. Where any person through text message, tweets, WhatsApp or through any social media post any abusive statement knowing same to be false with intent to set the public against any person and / or group of persons, an institution of government or such other bodies established by law shall be guilty of an offence and upon conviction shall be liable to an imprisonment for 2 years or a fine of N2,000,000 or both such fine and imprisonment. Nigeria’s constitution provides strong free expression protections (Art. 39). Furthermore, Article 66(2) of the Revised Treaty of the Economic Community of West African States stipulates protections for the press. The African Charter on Human and Peoples’ Rights, which Nigeria has ratified, also guarantees the right to freedom of expression (Art. 9). These protections were reaffirmed in the 2014 judgment in the case Lohé Issa Konaté v. Burkina Faso finding that imposing criminal penalties for defamation fails to comport with Nigeria’s obligations. Internationally, free expression is protected under Article 19 of the International Covenant on Civil and Political Rights, and the United Nations (UN) has specifically stated that the right to free expression applies to the online world — including social media platforms. In 2011, then UN Special Rapporteur on freedom of expression Frank La Rue specifically called for decriminalizing defamation. The bill also presents unbalanced and short-sighted policy calculations. This bill cuts against Nigeria’s spirit of openness and support for a vibrant free press and an innovative internet ecosystem. Journalists would be at risk of criminal penalties for reporting on public officials, silencing a crucial tool to combat corruption and encourage accountable governance. Already the continent’s largest economy, Nigeria has 15 million Facebook users, and its technology sector is rapidly expanding. This restrictive law will only harm innovation and deter investment. We also note that this is not the only legislation that criminalises free expression in this way. The unrelated Cybercrime Act of 2015, now in force, imposes strong penalties (3 years in prison or N7 million) in the name of security under sections 24(a) and 24(b), again violating the right to free expression. We were encouraged by President Muhammadu Buhari’s indication that he will not support a law that violates free speech, and by the statement credited to the House of Representatives that they will not do anything to close the space for free speech. We also remind you that civil society groups have drafted the Digital Rights and Freedom Bill, a forward-looking proposal that will promote human rights while enabling Nigeria to thrive economically in the digital age. Support the Digital Rights and Freedoms Bill, as a guarantor of human rights in the digital age. We are available to meet with you about this matter at your earliest convenience. 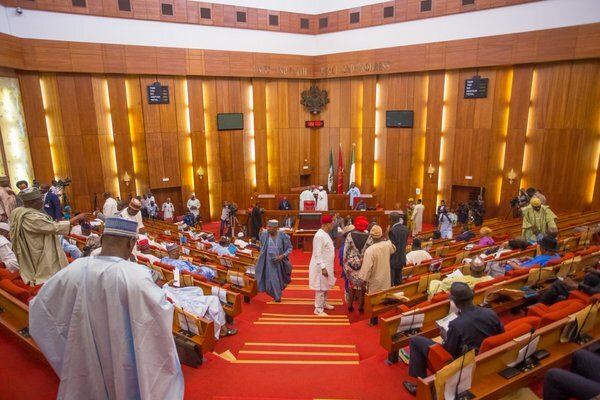 Abuja, Nigeria – Today a coalition of 20 Nigerian, African, and international rights groups delivered a letter to key officials in the Nigerian Senate, citing concerns about free expression and the criminalisation of free expression under the Frivolous Petitions Prohibition Bill. The Frivolous Petitions Prohibition Bill — which is popularly called the Social Media Bill — received its second reading in the Senate last month, paving the way for a third and final reading and eventual referral to the House of Representatives, the second chamber in the legislature. It would impose penalties of up to N2,000,000 ($10,000) and up to two years in jail. The open letter was convened by Paradigm Initiative Nigeria and Access Now, and urges Senators to drop the bill from consideration, but also underscores that the country’s Cybercrime Act, passed this year, imposes even stiffer penalties of up to 10 years. Signers of the open letter include Access Now, Association for Progressive Communications, Centre for Information Technology and Development, Civil Society Legislative Advocacy Centre (CISLAC), Collaboration on International ICT Policy in East and Southern Africa (CIPESA), Committee to Protect Journalists, Electronic Frontier Foundation, Enough is Enough Nigeria, Freedom House, International Service for Human Rights, Internet Sans Frontieres, Media Rights Agenda, Paradigm Initiative Nigeria, Pen International, Pen Nigeria, Rudi International, Social Media Exchange (SMEX), Web Foundation, West African Journalists’ Association and Zimbabwe Human Rights NGO Forum. We read with total dismay, the attempt by the Nigeria Senate to limit the right to free speech, a fundamental and inalienable rights of Nigerian Citizens through “The Bill for an Act to Prohibit Frivolous Petitions and Other Matters Connected Therewith (SB.143 )” (A.K.A “Social Media Bill”) sponsored by Senator Bala Ibn Na’ Allah from Kebbi South. We consider this bill as unnecessary, because the Cybercrime act 2015 (Section 24) which in itself should be amended, already has tougher provisions. Also, Nigeria has laws that cover libel and slander. The said bill in Section 3 (3), attacks free speech offline. It states that a person shall be liable for imprisonment of 2 years or 4 million Naira for publishing an allegation, a petition or a statement with a “malicious intent to discredit or set the public (“public” written as “published” in the said bill) against any person or group of persons, institutions of government in newspapers, radio or any other medium whatsoever”. Section 3 (4) of the same bill attacks free speech online, stating a 2-year jail term or 2 million Naira or both as punishment for sharing messages that are classified vaguely as “abusive”, on any social media platform. “The Bill is another attempt at limiting freedom of expression, especially on a platform that has allowed citizens to connect with others who also need to do the same, so they can take appropriate joint action,” stated ‘Boye Adegoke , Program Manager (ICT Policy) at Paradigm Initiative Nigeria. We want to state unequivocally as concerned organizations that we reject this attempt by the Nigerian Senate to suppress the voice of citizens. We consider this move as repressive, backward and against the spirit of democracy. In partnership with other members of the NetRightsNG civil society coalition, including Enough is Enough Nigeria, Paradigm Initiative Nigeria has drafted a positive rights bill, the Digital Rights and Freedom Bill, to codify the online rights of citizens. As work continues with legislators to present the bill in the Senate and the House of Representatives, we invite legislators to focus on promoting openness and guarantee rights instead of attempts that can hurt Internet Freedom in Nigeria, so that we can consolidate on the gains of citizens’ participation in governance processes through legislations that promote free speech, to formally situate power where it actually belongs – with the Office of the Citizen. PIN hosted 507 students from 22 tertiary institutions at the 4th edition of TENT Gathering which held at Nnamdi Azikwe University, Awka from Tuesday 24 – Thursday 26th November 2015. Institutions represented cut across South-South, South-East, South-West and North-West regions of Nigeria. Of the 22 institutions present, 16 participated in the Clash of the Campuses on the final day of the 3-day event. The host institution, Nnamdi Azikwe University emerged the winner and was presented the 2015 Taiwo Bankole Ogunyemi 1 Million naira prize. Anambra State University emerged as the 1st runner up and University of Benin as the 2nd runner up. Following the event, 8 institutions indicated interest in the establishment of TENT@School clubs in their schools beginning from 2016. Digital Jobs training 2015 ended with IT and Web training from 3rd to 5th November, 2015, and Social Media specialised training from 10th to 11th November 2015. The IT and Web training was attended by 40 people and was facilitated by Adebola Oni. The participants learnt how to create and manage a website using WordPress. The Social Media Class was facilitated by PIN’s Digital Media Manager, Olamide Egbayelo. 14 participants attended the 2-day training and learnt how to manage and create strategies on various social media platforms. PIN uses this medium to thank all stakeholders (knowledge and resource partners) who contributed to the success of this project in the year 2015; as we look forward to another impactful year from January 2016. 62 out 63 students who were admitted into AbaLIFE 2015D training program received their completion letters on the 27th of November 2015 at the ABIC. The second edition of the annual AbaLIFE annual town hall meeting held on the 20th of November 2015. Students of the 2015D session as part of their training carried out community service project of visiting some secondary schools in Aba, enlightening them on the importance of computer literacy and life skills for youth. The Ajegunle L.I.F.E Quarterly workshop took place on the 7th November as part of the effort to further develop the students and the alumni. The workshop was facilitated by Mrs. Iruka Ndubuizu, Executive Director of Euraka Consulting; who talked about “overcoming challenges”. Ajegunle L.I.F.E concluded the 2015D training session on Friday 27th November 2015. 39 of the 40 selected students successfully completed the training. Two AjegunleLIFE alumni started interning with GINA Consulting (a management consultancy firm in Victoria Island Lagos). The ICT Policy Office paid an advocacy visit to the vice-chairman of the communications committee of the House of Representative, Hon. Chukwuemeka Ujam to discuss the sponsorship of the Digital Rights and Freedom Bill. Honorable Ujam has agreed to lead other Honorable members of the House of Representatives in sponsoring the bill. PIN Executive Director, ‘Gbenga Sesan also attended the 2015 edition of Internet Governance Forum (#IGF2015) which held in Brazil. PIN in partnership with Facebook, CIPESA and APC hosted a side-event themed ‘State of the Internet in Africa’ at the forum. The Federal High court heard the data privacy case that Paradigm Initiative Nigeria (PIN) and Public Private Development Center instituted against the National Identity Management Commission on Wednesday 18th November 2015. The case has been adjourned to February 2016 for final determination.